So the day finally came for our work to be revealed to the public and I couldn’t be more proud of everyone involved. It’s been such an eye-opening and inspiring experience working with such a lovely group of people. Each person has brought their own experiences and hopes for the future to light in their Collaborative Self-Portrait and I think they look great! It was nice to see people moving around and looking at the exhibition. I enjoyed hearing people chatting to their friends and strangers about the photographs and the work that went on behind the making of the images. It’s still hard for me to believe that so much time has passed and we’re finally finished. It has flown by! 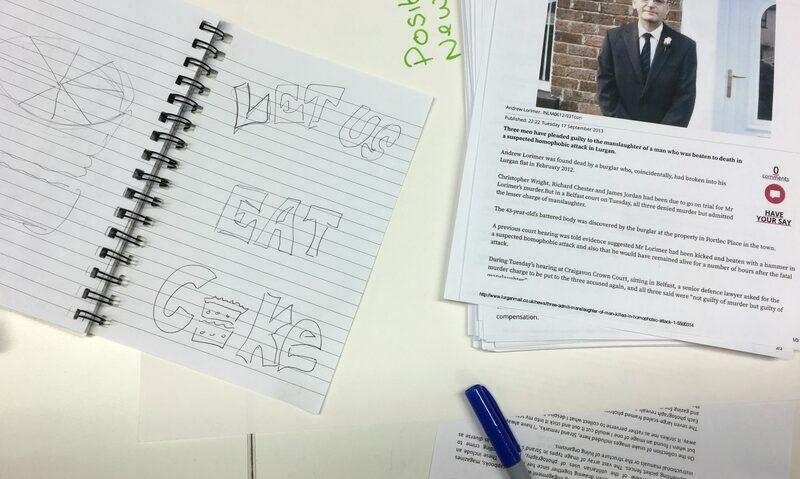 I hope everyone who looks at Let Us Eat Cake comes across at least one photograph that resonates with them. If they don’t, then I hope they at least understand why we decided responded to the themes and why they are important to us. I hope they feel challenged and take time to think. Just take a few seconds to step into our shoes. Now that the exhibition is up I’ve been in a more reflective mood. Taking part in Let Us Eat Cake has allowed me to explore so much about what it means to be a LGBTQ+ person in Northern Ireland. I’ve had the chance to reflect on the past, all those LGBTQ+ people who have been so terribly treated, and my own history. I’ve also had the chance to think about the present, my place in the world, the things that are important to me, and what’s happening around the world to others. And I’ve had the chance to think about the future, to consider: What kind of society would I like to live in? What sort of things would I like to have in my life? Where do I want to be? I’m not going to lie, it’s been an internal roller coaster for me at times. One of my downfalls is letting my mind run away with me too much. In my defense, there is so much to digest when it comes to really delving deep down into society’s views, traditions, perceptions, faiths, and the many other things that came up in our conversations that have made me even more aware of current affairs related to LGBTQ+ rights, histories and conflicts. But it’s been really worth it. I used to think I’d be happier moving away to an island somewhere away from the media, politics, all the division, hate and negativity which always seems to try to weigh us down. But now I’m really looking forward to keeping my feet firmly on ground in Northern Ireland. I’ve come to learn that people from here are some of the most resilient, brave, honest, caring, and stubborn people on the planet. Northern Ireland WILL always be my big crazy and fabulous home.